Today's Forum was a chance for the parish to meet St. Bart’s newest Assisting Priest, the Rev. 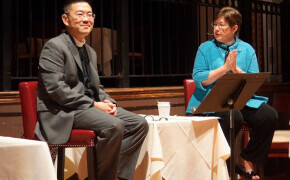 Patrick S. Cheng, J.D., Ph.D. Patrick is Chief Compliance Officer for the Church Pension Group; Affliated Associate Professor of Theology, Chicago Theological Seminary; and a theologian in his own right. As St. Bart’s usual Friday Eucharist presider and preacher, Patrick has quickly become beloved for his insightful homilies and warm pastoral presence. Listen in, and enjoy the Forum.